Sitting across from Theresa May during their cabinet away day at Chequers, our leading Brexiteers - Boris Johnson and Michael Gove, David Davis, Andrea Leadsom and Liam Fox, and tactical leavers like Jeremy Hunt and Gavin Williamson were exposed to something they're unaccustomed to: the harsh consequences of their political posturing. In the footage taken from a distance, we could see Johnson waving his hands, as if mere gesticulation would make call forth his post-Brexit fantasy into being. Reality appears to have then stalked the corridors of the Prime Minister's country retreat, mugging the Brexiteers one-by-one. Yes, we're on for a soft Brexit but that doesn't mean the position she has come up with is any good. It is, as per the custom and practice of Theresa May, a fudge. What we have here is what May has dubbed a 'facilitated customs arrangement'. This is not the same as staying in the customs union or being part of one, nor is it a customs alignment. One has to envy her admirable capacity for linguistic contortion, but it does mean these things. The deal posits a common rule book in which the EU and the UK agree on standards for trade between it and the UK area, and where we would collect tariffs on the EU's behalf on goods coming through UK ports from outside the EU. This allows for the continuance of frictionless trade, at least on paper. However, and much to the anger of hard Brexiteers, because the UK is no longer a member of the EU we have no say over these common rules. Just as sundry remainers warned, the UK has ended up as a rule-taking satellite of Brussels. And that also means the European Court of Justice, another bête noire of the right, still exercises something of a legal jurisdiction over the UK. Now, it is true all of this is subject to a final say by Parliament, its formal sovereignty is explicitly referred to by May, but in practice the choice before it is choose this deal (or a permutation thereof), or Wrexit. You might agree or disagree, but this at least seems simple and straightforward, right? Wrong. The issue is this recipe for frictionless trade refers only to goods. While welcome news for the supply chains that have outgrown the borders of EU member states, this does not pertain to services. As one of the four freedoms of the EU (movement of goods, services, capital, and people) respecting the status quo on goods while looking for something more bespoke on services isn't likely to float the EU's boat. Remember, Brexit was sold on putting up barriers between us and them, which is certainly how Michel Barnier and Donald Tusk have interpreted matters. This will be a definite area of tension when negotiations resume. Where things might not get as hot and bothered as everyone's expecting is on free movement around the EU. The headlines say this will come to an end, but in practice? According to the BBC write up, we can instead look forward to a "mobility framework" which would facilitate travel, study and work. No visas, no border checks, no nonsense. In all likelihood this is another fudge which will more or less support the status quo. For instance, EU citizens coming here will be expected to have a job or student place and have no or very restricted access to social security, whereas those already domiciled in the UK retain existing rights and protections. The former is very close to how many member states already interpret freedom of movement, so here the Tories can tick the rhetoric box without having to get into a row about it. Anything less than this and the EU will expect the government to return to the drawing board. From the point of view of hard Brexit, this is the worst of all worlds, the coming to life of their dread Brexit in name only. How then has May managed to herd her mutinous cabinet Brexiteers behind a position that is an obvious selling out of the kippery voters she annexed in 2017? After all, when it comes to factional balance nothing has changed. Reports that quitting ministers would have to take the walk of shame down the Chequers drive way and a cab back to London was the kind of petty theatre we expect from the Tories, but to keep them on side has to be a touch more substantial. Until the Times and Telegraph splash their insider accounts of the meeting tomorrow and over the coming week, we can think about the politics. For some, getting Brexit through at any price shows the deed has been accomplished and whatever deal is struck in October can be later massaged and subject to permanent negotiation. Others might be happy to go along with a soft Brexit and see it fail in due course, providing them ample opportunities for grand standing and pitching leadership election campaign tents. 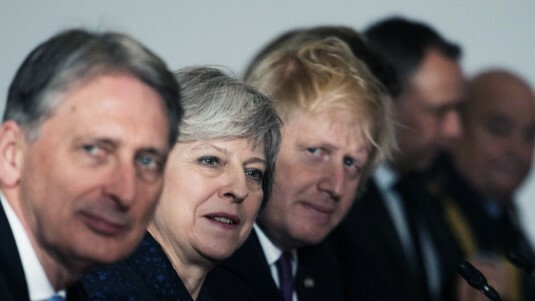 Third, a group of them must know there is a possibility the EU won't go along with this, no deal will be struck, and the no deal hard Brexit scenario they covet comes into being next March. And, lastly, forced to confront the politics of the situation as they are as opposed to what they want them to be, the Brexiteers are entirely disarmed. They've had two years to come up with something, and all we've had is wind. They have no alternative to Brexit in name only. Interestingly, this incoherent but soft Brexit has upset some remainers too because it's not Brexity enough. But what of the EU, are they bound to reject this? From a game theory point of view, time is on their side and they can keep on knocking it back until the UK either accedes to their demands or goes no deal. We are in a weak position because Theresa May put us in one. She did not have to trigger Article 50 in March last year, and she didn't have to tread carefully around her party so it's only now the government have a negotiating position to take to Brussels. Then again, the EU have taken Brexit far more seriously (indeed, Japan famously did more contingency planning for it than the UK did), and appear to be alive to the consequences of no deal. As sundry Leave politicians observed during the referendum, there are jobs and businesses in the EU dependent on uninterrupted trade with us. It is in the interests of the biggest nations, chiefly France and Germany thanks to their geographic proximity, that the economic damage be limited. For this reason, and because there are other pressing problems, Brexit needs to be put to bed quickly and with a minimum of fuss. Therefore, a line-by-line negotiation designed to iron out the contradictions (and the idiocies) seems likelier than a flat out rejection. Earlier in the week, we discussed a hard road to a soft Brexit. After all the drama, tantrums, backbiting, positioning, and more than a fair share of national humiliation, we've got the logical culmination of so many competing factions and ambitions: a soft Brexit in which the slogan of taking back control is rendered meaningless. What next? It must surely put severe strain on the Tories' declining electoral coalition. Could this mean the end of the electoral logjam and an opening of a new period of fluidity in establishment politics? Not sure this deal is good news. If Skwawkbox is right, and the Blairites are about to launch their new Tory-lite billionaire-funded party, it would probably attract a fair chunk of the Labour Remainer vote while attracting far fewer Tory Remainers. Whereas a hard Brexit post-Chequers Tory party would have had the opposite migration effect. I think this blogger's opinion that the Blairites would go when their departure would cause Labour the most problems is right. And it would cause a lot of problems for Labour right now. We'll see about the centrist stuff. Going now would cause problems for Labour, but with the focus on Tory infighting and Brexit negotiations it's not one I'd call ideal timing for them. Also consider centre-leaning Tory voters. They're not fussed on the details but they're getting a soft Brexit. What could a vanity project of a few disgruntled Labour MPs offer them? Under this position they wouldn't even be able to recruit Woke Soubz.